Pound Cake Cookies, or another excuse for a lemon cookie. 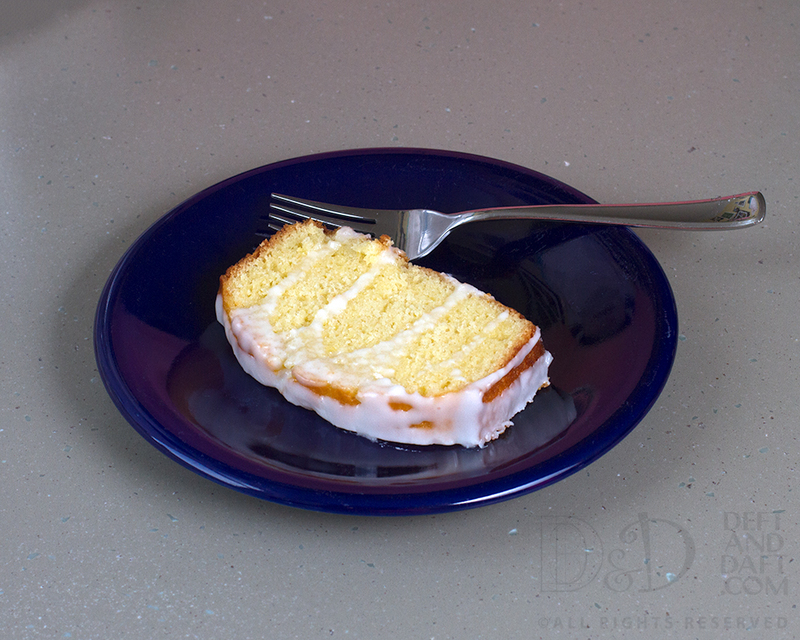 This is recipe from My Baking Addiction, a great blog that I look at regularly. With a couple of small modifications. But that’s me. Can’t help myself. 1 1/4 cups confectioners sugar, sifted – a must! Preheat oven to 350 degrees. Over waxed paper, sift together all purpose flour, baking powder, and salt. In a bowl, rub lemon zest into sugar. Add to stand mixer with butter, and beat until light and fluffy, about 3 minutes. Add eggs, one at a time, lemon juice, and vanilla. Gradually, add the flour mixture, and mix until just combined. 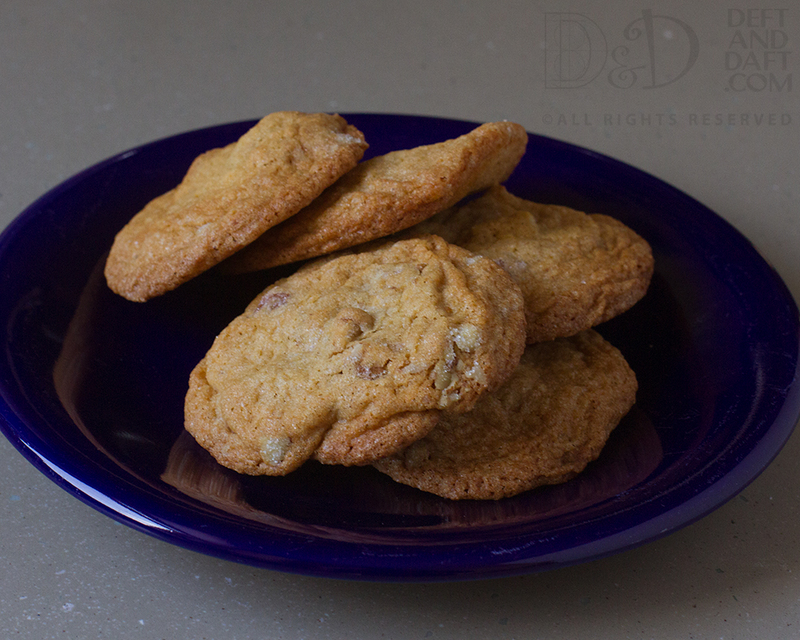 Using a cookie scoop*, place dough about two inches apart on parchment-lined cookie sheet. Bake for 10 – 12 minutes, or until bottom is golden – which is really a strange way to tell, in my opinion. Allow to cool for a few minutes then move to a wire cooling rack. 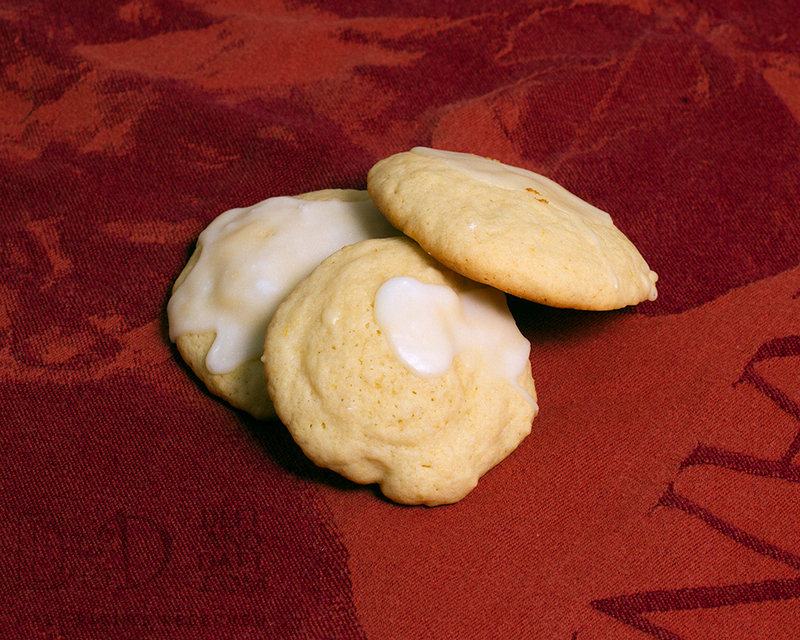 Once cookies cool completely, make the glaze of lemon juice and confectioners sugar. Glaze the cookies and let the glaze harden. * I have a cookies scoop, but have no idea how to tell what size it is. How does one go about that? Ugh. But in this case, it worked. 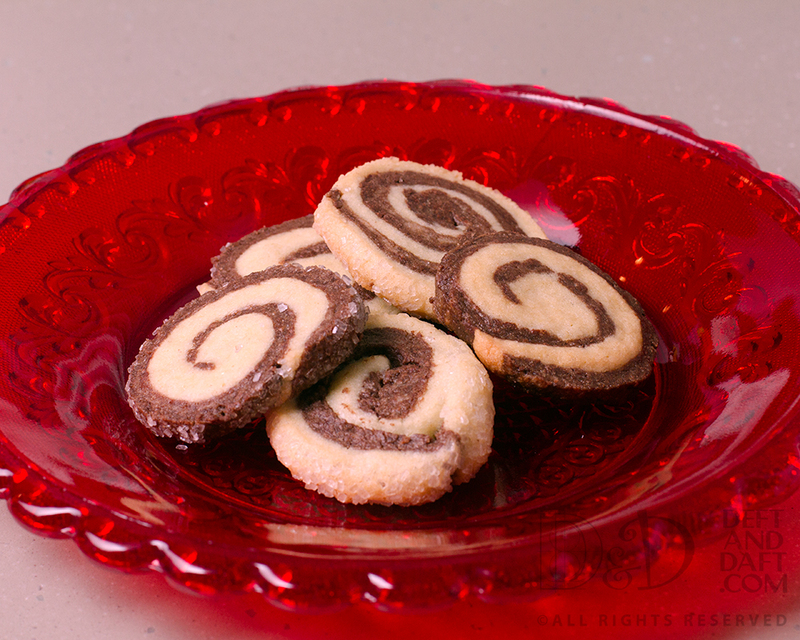 I’ve been making cookies / desserts at the suggestions of others just to get me to try new things, and one suggestion a couple of weeks ago was a pinwheel cookie. The guy that asked for it said his mom used to make them for him, but had not in a while. Well, after I checked into what a pinwheel is, I understand why his mom doesn’t make it anymore. You have to really love someone (which I suggested his mom may not do any more – which was mean, but funny) to do this amount of work … And this much frigign’ math. But, since I have never 1) eaten a pinwheel or 2) made a pinwheel. I took it as some sadistic challenge. And so far that seems to be an accurate statement of the experience. I’ve gone so far as to clock the active time involved in putting this damn cookie together. I even made templates – who what nerd does that?? Me. sigh. Yields about 10 dozen 2-inch cookies. If you can roll everything in the correct dimension. Yep that was wasn’t me. Sift together the flour, salt, and baking soda. In the bowl of a stand mixer fitted with the paddle attachment, cream the butter on medium-low speed until smooth, about 2 min. Add the sugar in a steady stream and mix for another 2 min. Add the egg and vanilla and mix until well combined, scraping the bowl as needed. Reduce the speed to low and add the dry ingredients in two additions, mixing just until combined. Remove 2 cups less 2 Tbs. of the dough and set aside. Dissolve the espresso powder in the boiling water and set aside briefly to cool. Then mix the espresso and cocoa powder into the remaining dough. Reduce the mixer speed to low, add the warm melted chocolate and mix just until thoroughly combined. Portion each flavor of dough into three equal pieces. (For accuracy, use a scale – yes, do this) Shape each piece into a 5×5-inch square on a piece of plastic wrap and wrap well. The chocolate will be thicker than the vanilla. Refrigerate the dough for 30 min. (If the dough becomes too hard, let it stand at room temperature for a few minutes before rolling) = 1 hour. While the dough is chilling, tear off twelve 12-inch squares of waxed paper. Roll each piece of dough into a 7×7-inch square between two sheets of the waxed paper. Without removing the waxed paper, layer the squares of dough on a baking sheet and refrigerate for 10 to 15 min. Have ready three 15-inch sheets of plastic wrap = 20 more minutes. To shape the cookies, remove one square of the vanilla dough and one square of the chocolate dough from the refrigerator and peel off the top sheet of waxed paper from each. Invert the chocolate square over the vanilla square (or vanilla can go on top of chocolate; try some of each for variety), taking care to align the two layers as evenly as possible. Using your rolling pin, gently roll over the dough to seal the layers together. Peel off the top layer of waxed paper. Starting with the edge of the dough closest to you, carefully curl the edge of the dough up and over with your fingertips, so no space is visible in the center of the pinwheel. Using the waxed paper as an aid, continue rolling the dough into a tight cylinder. After the cylinder is formed, roll it back and forth on the counter to slightly elongate it and compact it. And then roll is really crunchy sparkling sugar (not in the original recipe, but so worth it). Transfer the log to the plastic wrap, centering it on the long edge closest to you. Roll tightly, twisting the ends of the plastic firmly to seal. With your hands on either end of the log, push firmly toward the center to compact the dough. It should be about 9 inches long and 1-1/2 inches thick – or whatever it is – really. Repeat with remaining dough. Refrigerate the logs until firm enough to slice, about 3 hours, or freeze for up to three months = 20 more minutes. Heat the oven to 350°F. Line rimmed baking sheet with parchment. Working with one log at a time, roll the long in large grain sparkling sugar. Then, use a sharp, thin-bladed knife to slice the dough into 3/16-inch rounds (I used my tomato knife, not thin, but beyond sharp). Set the rounds about 1 inch apart on the prepared pans and bake until the tops of the cookies feel set, 12 to 14 minutes, making sure to rotate pan halfway through. Let the baked cookies stand for 1 minute on the pan, then transfer to a rack to cool completely. When cool, store between sheets of waxed paper in an airtight container for up to two weeks, or freeze for up to three months = 12 – 13 minutes x 6 =78 minutes. Total time, roughly, since I’m not good at math = 2 hours & 20 minutes, not including time in the fridge. With this all said and done, now that I have experience doing it, I will make these again. Nothing is particularly daunting. There are just many steps and it takes time. It’s fairly forgiving too because my measurements of the squares were not correct. I just made them match and tried to make it close and it worked. As a not huge chocolate fan, this chocolate part of the cookie reminds me of Guinness – coffee, dark chocolate, lovely. This recipe originally made two 9″ x 5″ loafs, but since I only have one 9″ x 5″ pan which is perfect for my mom’s banana nut bread and the other one is 8″ x something, I decided to just half the recipe and deal with it. This, therefore, is for one loaf. I have to say I love my loaf pans – they are the Williams-Sonoma gold touch and pretty much amazing. I totally recommend them, no, really – I have no dog in this fight. They are far and away the best baking pans. Baking so evenly and made in the USA – that’s right – just like my Nordic Ware – which are bundt pan magic. * I just keep adding to my gold touch collection – 2 9″ round cake pans, 9″ x 13″ baking pan, and the list goes on. Hey W&S, please send me the 12 cup cupcake pan just because I’m kind of nice (sometimes), well not really. This is one of the softest cakes I’ve ever made. The texture is so light that it seems etherial. It is great plain, but outstanding with syrup and glaze. It makes a great breakfast – hardly surprising, I know. I like to bake for others, but sometimes, like this, I just want to make something I think I will like. And that usually means lemon-something. Can’t help it. But I did share this around and I think it was well received. Preheat oven to 350 degrees. Spray 9 x 5″ loaf pan with cooking spray. Line with parchment and spray again. Sift flours, baking powder, baking soda, and salt over a piece of waxed paper. Put eggs, sugar, lemon zest, and lemon juice in a food processor and pulse until combined. With food processor running, drizzle the butter through the feed tube. Add the sour cream and vanilla and pulse to combine. Transfer to a large mixing bowl. Sprinkle the flour mixture, one third at a time, gently fold. Do not overmix. Add batter to loaf pan, and bake for 20 minutes. Rotate pan, reduce oven to 325 degrees and bake for 30 – 35 minutes more or until toothpick comes out clean. Cool in pan for 15 minutes. In saucepan, heat lemon juice and sugar over medium heat until sugar dissolves. Heat for a few more minutes until it thickens just slightly. Remove from heat and cool slightly [saying slightly quite a bit]. Line a sheet pan with parchment and invert loaf onto pan. Using a skewer, poke holes into top of loaf. Brush top with lemon syrup. Let soak into the cake. Let cake cool completely, at least 30 minutes. In a small bowl, whisk together confectioners’ sugar and 2 Tbs lemon juice. Should be thick, but pourable. Pour the glaze over top and let it drip down the sides. 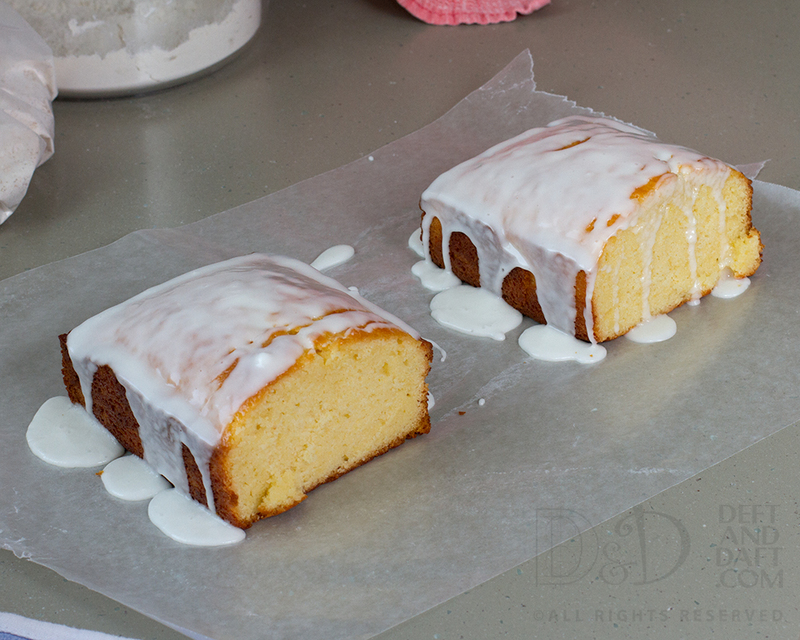 Let lemon glaze harden, about 15 minutes. Soaked unglazed loaves will keep wrapped in two layers of plastic and frozen for up to 6 weeks. Glazed loaves will keep for 3 days, wrapped tightly in plastic wrap, at room temperature. I think they get better after the first day. This is a half recipe of the original from Epicurious from Baked: New Frontiers in Baking. The food processor part of this really surprised me, but it did work. *I will not even go into how many Nordic Ware bundt pans I have. I think it might be not natural. But I still love them! It rains pretty much every day in our part of Florida during the summer. It is annoying to some degree, but mostly it is a good thing. Do not have to water the garden or my potted Meyer lemon and it does bring the temperatures down. But this weekend was an experience. Hurricane Patricia hit a front that was coming our way and – boom – lots o rain. While it is not as bad as Texas – thankfully – it just keeps coming. It is the way a storm works and it is pulling water up out of the gulf just to say hello to us. And with gusts that feel like tropical storm which I really enjoy – you can go outside – get rained on but not worry about lightening – okay – I love it. It is not terrible, but it definitely is different. Tomorrow is supposed to be the same and I’m kind of excited about it. It is not a hurricane, or a tropical storm, but it has all the best parts of both – if that makes a weird sort of sense. Guess it is a Gulf Coast thing. I can hear another line of rain coming in right now and I am thinking that will make sleeping tonight some kind of excellent. Kind of like I’m not a chocolate person, I’m also not an ice cream person either. But the one kind of ice cream I adore is butter pecan ice cream, especially if the pecans are roasted and salted as they should be. Growing up, even though I lived in an huge city, we had a local dairy – Skinner’s Dairy. There is even a street called Skinner’s Dairy Road that marks where the dairy used to be. Now it’s full of lord knows what. [That city just keeps, stupidly, getting more and more congested.] Even cooler than the dairy though there were local dairy stores all around town and we would go through the drive thru on a regular basis to get milk, and in my dad’s case, ice cream. His favorite is Cherries Jubliee to which I say, yuck. Chocolate was okay because we didn’t eat ice cream in bowls, but in big cups. And with the chocolate ice cream, we would pour ice cold milk over the ice cream and it made a crunchy shell which was so good. Even though I’m not a chocolate person. Nonetheless, butter pecan was always, and will continue to be, my favorite ice cream. And any cookie recipe that says butter pecan, I’m going to try it. Especially since we have the best local pecans ever. Toast the pecans in the oven or on the stove top in a skillet. When you just begin to smell them, they are done. Sift together the flour, cornstarch, baking soda, and salt over a piece waxed paper. In the bowl of a stand mixer beat the butter for one minute until smooth and creamy. Add sugars and beat until light and fluffy. Beat in eggs, one at a time, and then mix in the vanilla. Slowly mix the dry ingredients into the butter mixture. The dough will be stiff (and make your stand mixer buck about a bit). Add the pecans until just mixed. Wrap dough in plastic wrap for 3 hours to up to 3 days. Remove dough from the fridge for at least 20 minutes while the oven heats to 350 degrees. (If the dough is in the fridge for longer than 3 hours, give it 30 minutes or so.) Line baking sheet with parchment. You just have to do that with all cookies in my opinion. Once chilled, based on the original recipe, the dough might be slightly crumbly but as you roll the dough into 1 Tbs balls it will work out. It wasn’t an issue. Don’t stress too much. Then, the best part, roll them in sugar ~ yeah ~ and bake at 350 degrees for 11 minutes. I love a good food experiment, especially when it seems easy, uses things I already have on hand, and in this case, I only invested the price of a bag of pretzels. Why not try it? 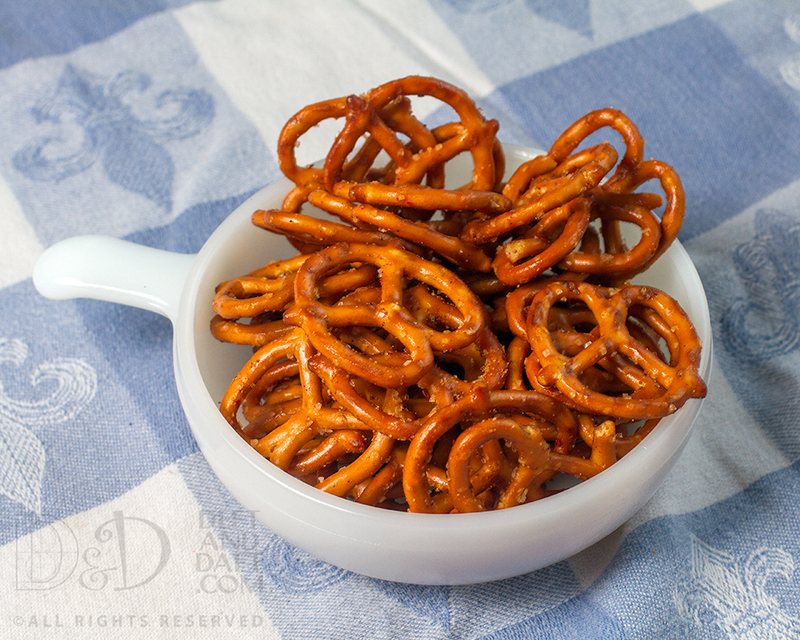 I’ve been seeing recipes around for an apparently easy way to make flavored pretzels. They seemed a bit too easy to be honest, but I wanted to see if the methodology would really work. So on a lazy Saturday, I just decided to give it a go. Here ’tis with my variation on the flavors. Well the method worked just fine. I did see some recipes that used a full cup of canola oil, but just as many used 3/4 and I went with that. Just a bit of a warning, the heat on these, if made as above, is at the end of it. The MotH got to the heart of it when he said, these are beer pretzels. 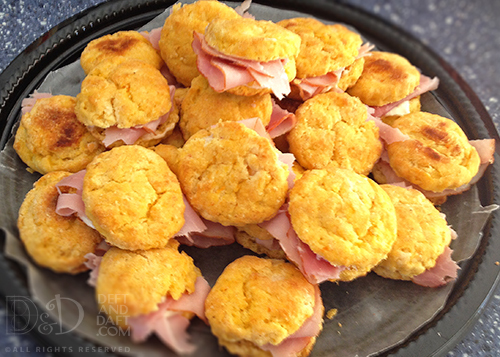 *you can also bake these in a 200 degree oven for 1 hour stirring several times.